Weekend Wants: Gingham, Suede, Bourdeaux and Gray. Good weekend you all! I am actually having a shop-your-closet September and staying away from all the stores this month, but one can dream of pretty clothes for their closets right? I call it "Wishful Shopping". So here are some "Weekend Wants". Clearly, I am still not letting go of the Summer since I am craving those gorgeous ombre green gingham laceup sandals and a pink gingham blouse (which I can totally make it work for Fall) and the wrap blue floral maxi dress too. Since the dress is with long/convertible sleeves in dark florals, it would be perfect to style for Fall and even later in the Winter. 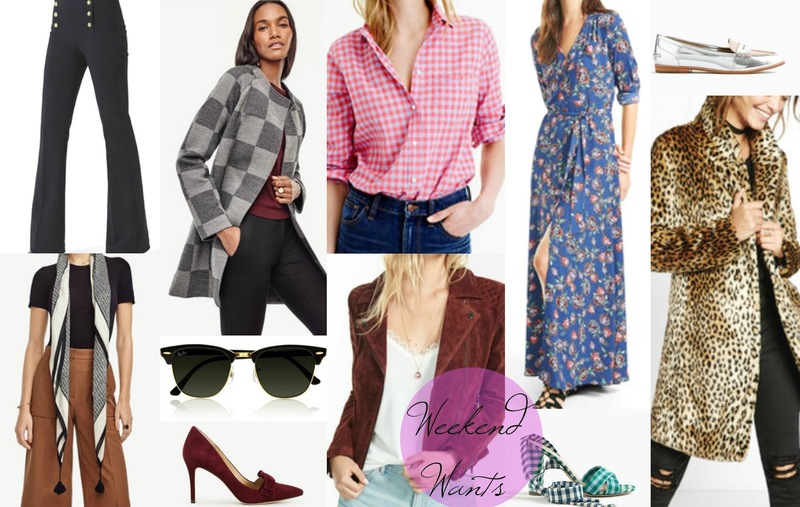 Rather than that, I, like everyone else in the world is craving pretty pieces for Fall like jackets, coats, scarves, loafers, suede and leopard. I have always loved burgundy/oxblood/bourdeaux and the rich suede jacket and pumps are perfection. My most favorite neutral ever though, one that is classic, chic and understated is gray. Both the colorblocked, tassel blanket scarf and the buffalo plaid wool coat are two stunning gray pieces - classy but with a pop. What are you up to this weekend? Shopping anyone?